This generally moderate tour follows a south-to-north route through Plumas, Lassen, and Shasta Counties, beginning with two days in or near Indian Valley, then moving up to Lake Almanor for two days, then further north to Mill Creek for a visit to Lassen Volcanic National Park. Finally, north of the park, the route heads up to Fall River Valley for a final stage around that pretty region. When we did this tour in 2008, we timed it so our last stage coincided with the annual Fall River Century in July, and we did the official century (or its 100-K variant) as our final ride. We also ended our second-to-last day 37 miles short of the start of the final stage, using our vans and car pool vehicles to jump across that gap. However, it wouldn’t be all that difficult for stronger riders to ride that stretch. We did it on Stage 2 of the Northern Peaks Tour, going the other direction. Check the route of that stage for the best way to do it, and see comments below (re Stage 6) for more thoughts on this. An easy loop around this very pleasant valley—perfect for cycle-touring—plus an out-&-back on an old mining road climbing out of the valley. Camp at Taylorsville Community Park. Showers. More climbing than on the previous day, but still quite moderate: up out of the valley to Antelope Lake, around the lake and back to camp. Beautiful high-country scenery. Mostly climbing early on and mostly descending on the way back. Another night in the same camp near Taylorsville. Stage 3: Taylorsville to Lake Alamnor. Shortest day of the tour, but much more uphill than down. Back across Indian Valley to the town of Greenville, then climbing along Hwy 89 to Lake Almanor. Ride up the east shore of the lake to North Shore Campground, just south of the town of Chester. Showers at camp and great views across the lake. Three long out-&-backs clustered near the town of Chester at the north end of the lake: Warner Valley, Domingo Springs, and Juniper Lake. Wonderful mountain scenery on very lightly-traveled roads. Each is mostly uphill on the way out and downhill on the way back, but in all cases, the climbing is mild. Spend another night on the shore of Lake Almanor. We take the long way to ride to our destination, beginning with a run back down the east shore of the lake, then heading up the west side, mostly on the delightful Lake Almanor Recreation Trail. Then, after leaving the lake, ride 25 rolling miles along Hwys 89 and 172 to Mill Creek Resort, a rustic old camp with a great swimming hole along the creek. Showers…and also cabins to rent. 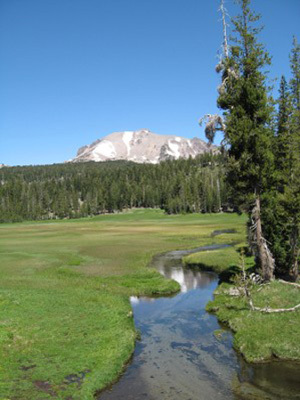 Ride to Lassen summit under the shoulder of Lassen Peak, in the heart of the magnificent national park. Stop along the way to explore the volcanic sights in the park…steaming fumaroles and mud pots. Over the top, head downhill off the north face of the mountain—a huge, entertaining descent—and on out of the park. More downhill follows before you end up at Subway Cave. As noted above, this is still 37 miles short of the next stage in Fall River Valley. Stronger riders might tackle it as a 96-mile stage, but another alternative—more in keeping with the moderate scope of this tour—is to split these miles in two with another overnight in the national park, perhaps at the Summit Lake campground. We stayed here on our Northern Peaks Tour, and it’s an excellent camp. No showers, but the lake is great for a dip. The century route is there if you want to do it, but it isn’t required. There are shortcuts aplenty in the valley and noted on our map. But for what it’s worth, this is a good entry-level century, about as easy as they come. Several riders bagged their first centuries on this course when we ended our tour here. The valley and the nearby hills and woods are a lovely spot for riding…super scenic and generally light on traffic. Spend at least one and perhaps two nights camping on the shady lawns at the fairgrounds in McArthur. Showers.